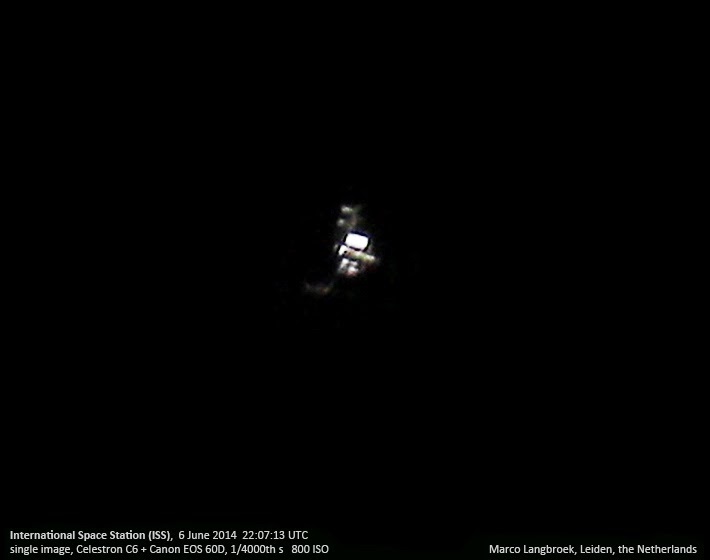 Yesterday (June 23, 2014) near 16:15:29 UT (18:15:29 CEST), the International Space Station (ISS) passed in front of the solar disc as seen from my observing location in downtown Leiden. As can be seen in the picture above, the transit was nearly central (the calculated central line was 600 meter to the north of me). 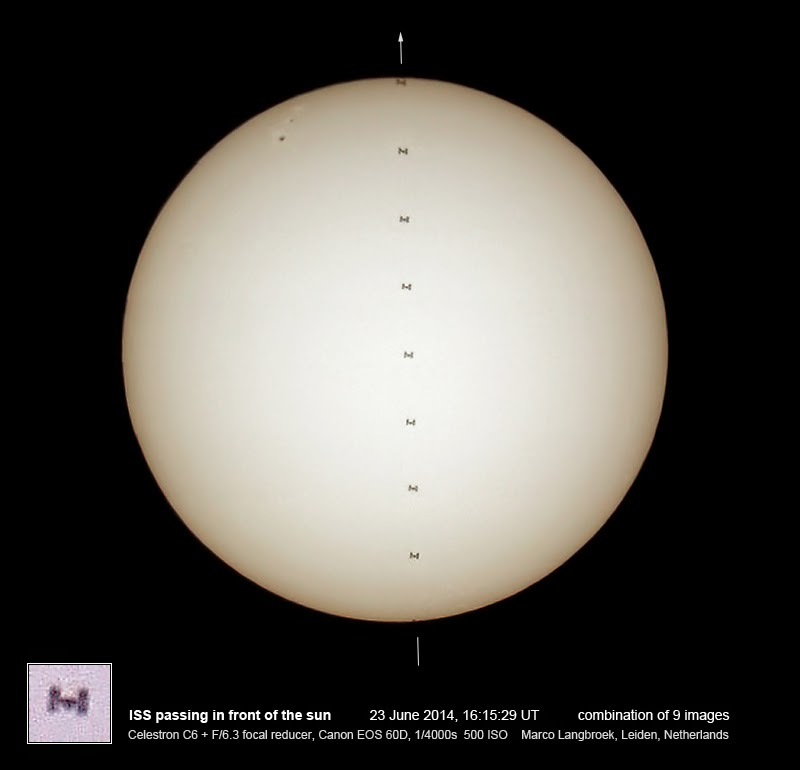 The whole event had a duration of about 1.5 seconds, during which 9 photographs captured the Space Station silhoueted against the sun. 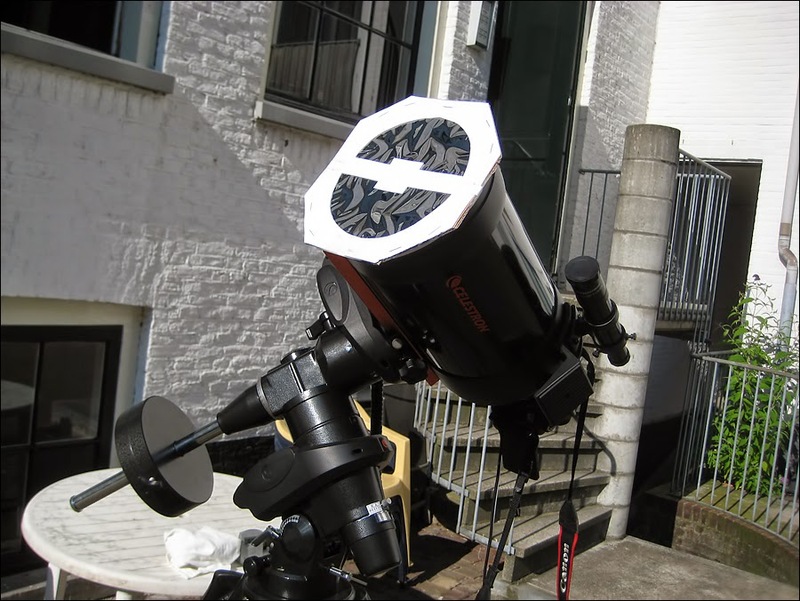 The images were made with my Canon EOS 60D through my Celestron C6 (15 cm Schmidt-Cassegrain), fitted with a Solar Screen filter and an F/6.3 focal reducer. The sun was low in the sky at an elevation of 31.8 degrees due West. The inset is a stack of the 5 best ISS silhouets. The images are not perfectly sharp, which is due to air turbulence (even at 1/4000 second) and the simple fact that I find it quite hard to focus the telescope properly on the sun, certainly when it is almost featureless. Nevertheless, I am satisfied with this image. I knew of the transit because I subscribe to alerts from CalSky for this kind of phenomena. In preparation for the actual observation, I download the latest ISS elements from Space-Track a few hours before the event, and load them into Guide to fine-tune the transit time and the path over the solar (or lunar) disc. Starting about 1 second before the calculated commencement of the transit, I start a rapid burst series of images at 5.7 images/second. Above are two pictures of the setup used. The filter mount is homebrew and quite simple (from thin cartboard). The filter itself is Solar Screen, a mylar filter with a double thin aluminium filter coating. Using such a filter makes it safe to look at the sun (NEVER look at the sun without a proper filter!). 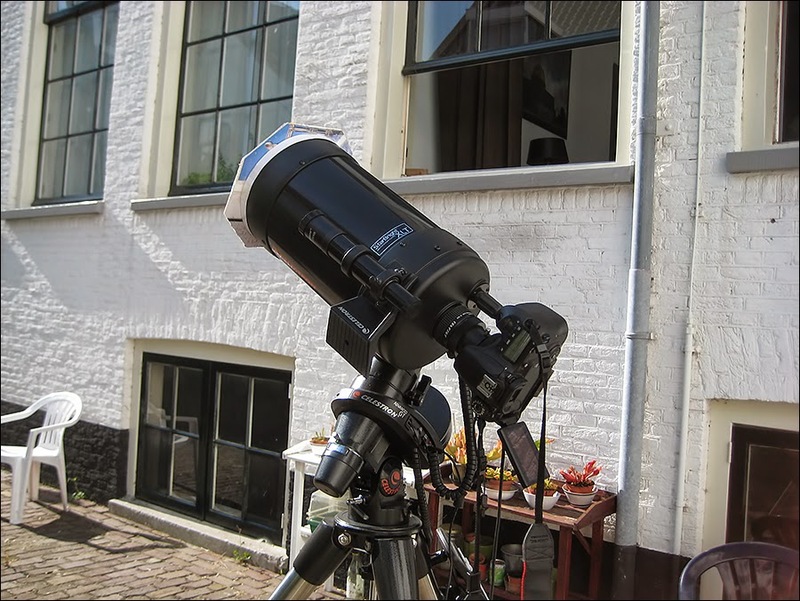 In order to be able to see anything on the camera LCD screen in the bright sunlight, I put a towel over my head and the telescope back during focussing. This observing site, in a polder park with meadows and polder ditches, is very tranquile. A choir of frogs was chanting during my observations, and meadow birds were adding their voice too. As I was observing, a low blanket of ground fog started to form, with my camera on tripod popping up just above it. 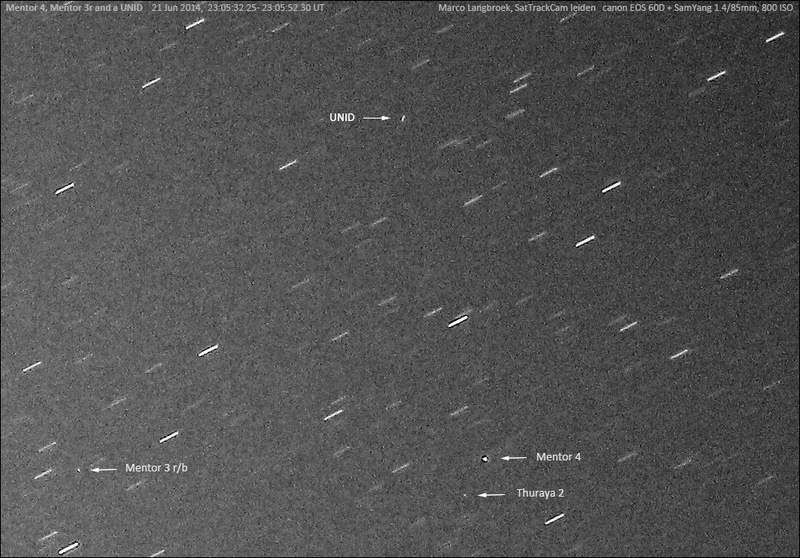 At the moment I am still slowly working myself through the 54 images taken, identifying objects, but I can already report that I captured two three UNID objects (for positions on the 3rd see here), two in GTO/GEO and one in MEOor HEO. They are not in the Space-Track catalogue nor in our classified catalogue. UNID 2 was detected on only two 20 second images taken half a minute apart. 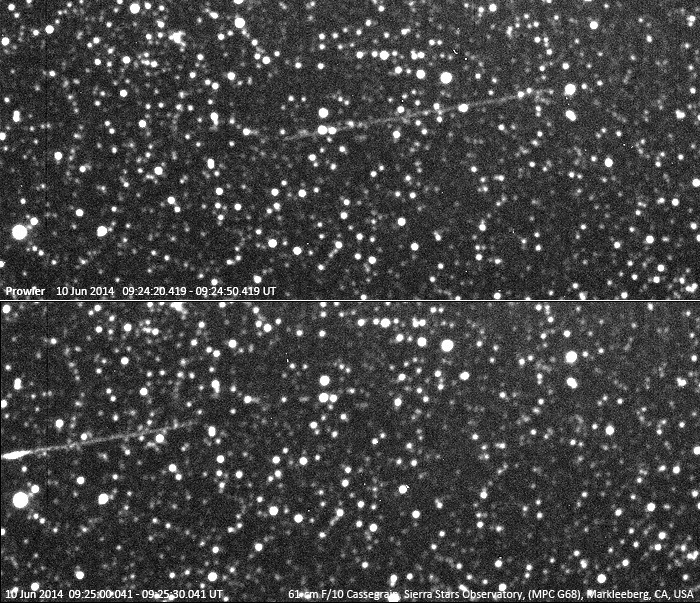 It is less trail like (see image above), but slowly moving south when the measurements on the two images are combined. It is either in a somewhat inclined GEO orbit or a GTO object near apogee. The image above also shows SBIRS GEO 2 (2013-011A), a classified geostationary SBIRS satellite (an Early Warning satellite looking for missile launches in Infra-Red). In addition, an old Russian r/b and a Russian military GLONASS (the Russian equivalent of GPS) satellite are visible. Star trails are slightly blurry because the FOV represents a detail near the edge of the image. UNID 3 was detected close to alpha Serpens in only two 20 second images taken 1 minute apart. It is clearly trailing. 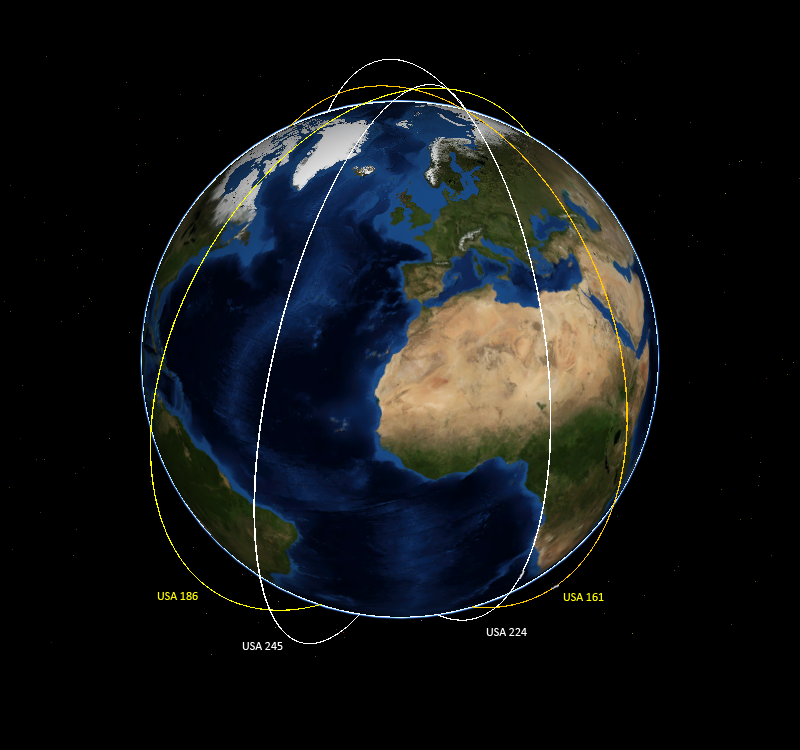 The positions fit either a circular MEO orbit, or a HEO orbit (the observation arc is too short to discriminate). Above, the two images that captured it are shown. The same image that captured UNID 1 also captured the military Radar satellite Lacrosse 5 (2005-016A, see image in top of this post), just as it was emerging from Earth shadow. It was about 54 seconds late relative to 8-day-old elements. That is a lot for only 8 day old elements. Hence it appears to have manoeuvered somewhere in the past few days. I have written on the enigmatic Prowler satellite (1990-097E) before. I periodically observe it using a 'remote' telescope (usually the 0.61-meter Cassegrain of SSON, MPC G68). 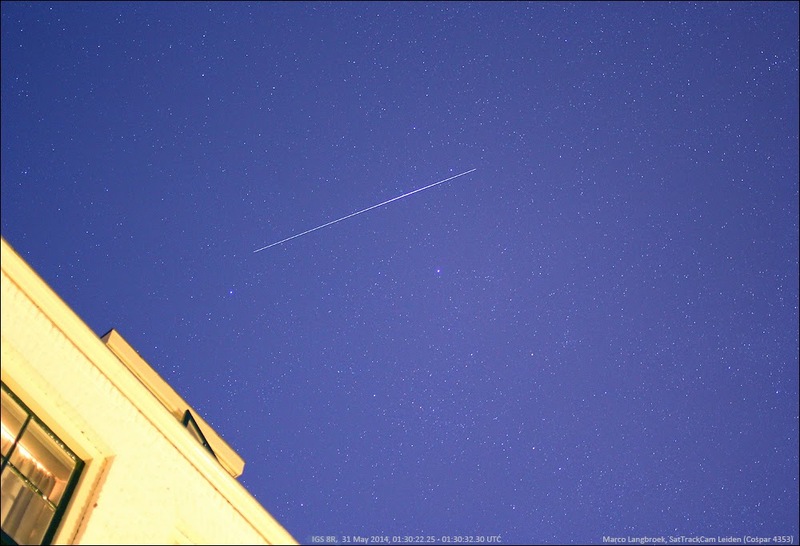 On 2014 June 10 I captured it briefly flaring - I had not observed that before, though other observers had. The brief flare can be seen near the edge of the image (the trail runs out of the FOV) in the lowermost of the two images above. Apart from these short flashes, observers report a much slower brightness variation. Indeed, I had suspected such from my own observations, as the trail brightness widely varies (between bright and completely invisible) between different image sessions. On May 27 for example, I also tried to image Prowler using the same 0.61-meter telescope, but it was invisible. As Allen Thomson remarked, part of this brightness behaviour might be due to Prowler's former stealth characteristics. I am a bit behind with posting the image above taken a week ago, on 3 June 2014 . It shows the KH-11 Keyhole/CRYSTAL optical reconnaissance satellite USA 161 (2001-044A), which was recently recovered. 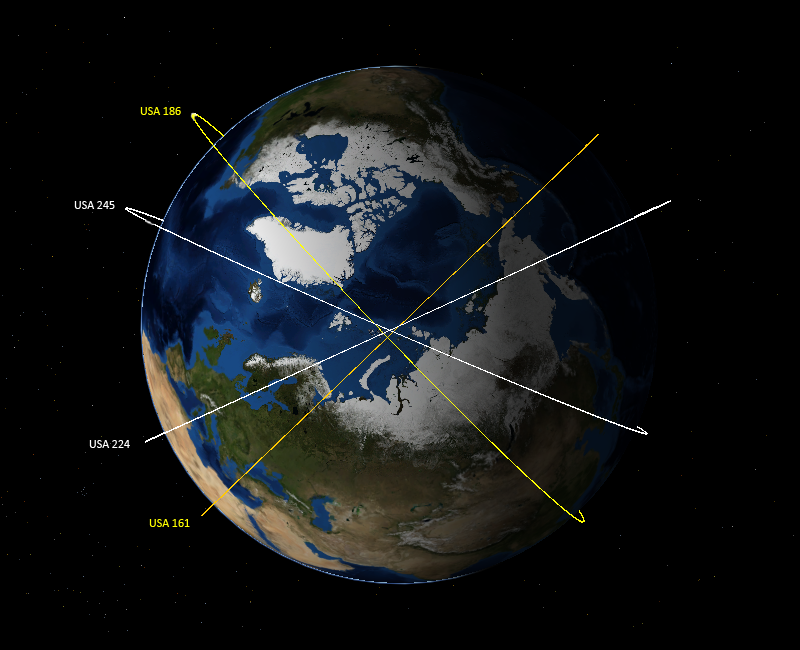 With new observations including mine, the orbit is now getting better defined. 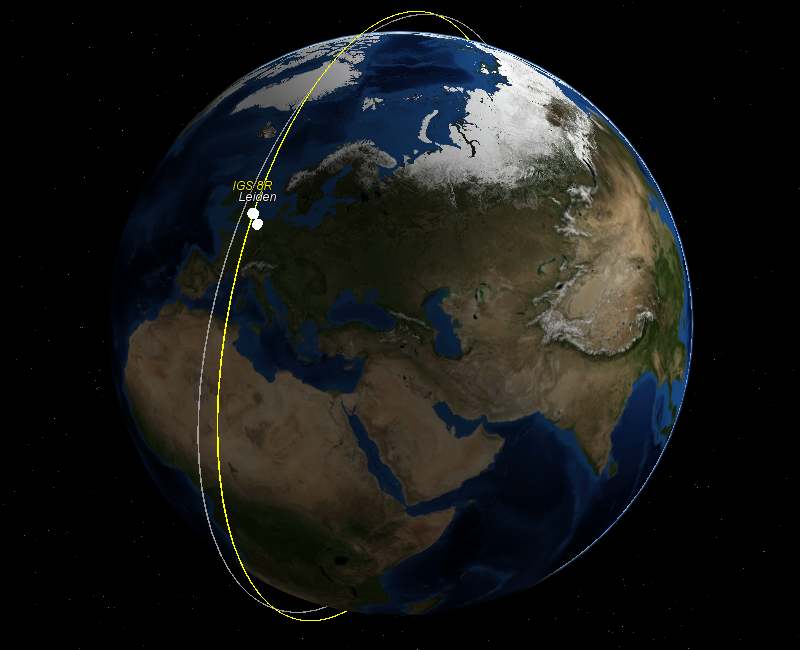 During the winter blackout, the orbit of the satellite appears to have been further circularized to a 389 x 391 km orbit, by a small perigee rise. 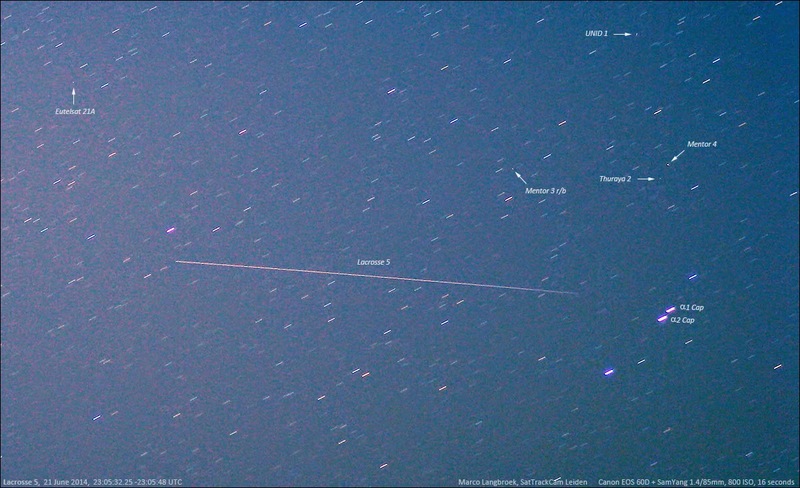 In the image above, another object is also visible: a Falcon 9 r/b, 2010-066K, at over 5000 km altitude at that time. So far, my satellite imaging has always been done with a DSLR and normal camera lenses and were essentially 'wide field'. The largest focal length I so far used was 180 mm. 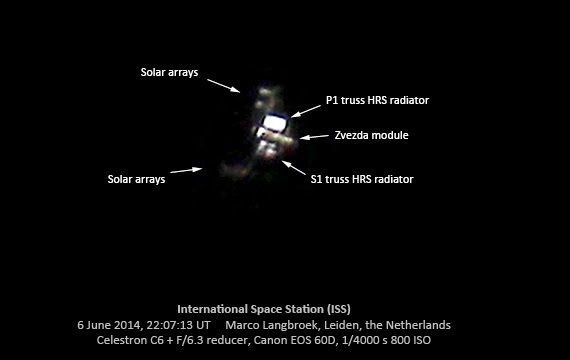 Last week I have experimented with telescopic imaging of the International Space Station (ISS), using my Celestron C6 (15 cm F/10 Schmidt-Cassegrain). 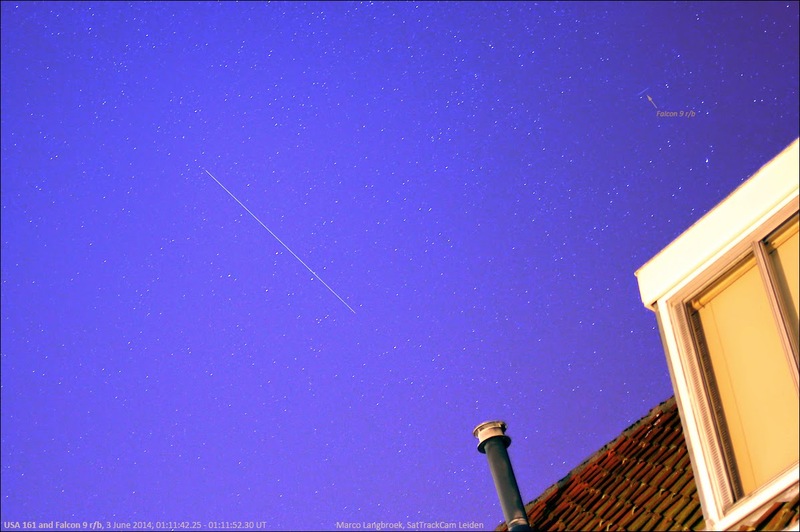 Above is the best image, shot 6 June 2014 at 22:07:13 UT as the ISS was zipping past beta Bootes. It is a single image from the series, taken at 1/4000th second at ISO 800. I kept it simple: I did not actively track the ISS, but looked for points where it passed close to a reasonably bright star, and then pointed the telescope to that position. As the ISS passed that point, I did a rapid burst series of images, a few of them which then showed the ISS zipping through the field. I used 1/4000th second exposures. That technique is actually enough to get some decent pictures. Later, I will probably experiment with active tracking using computer guidance of the mount, and see whether video might yield more that photography (one drawback of video is a lower resolution, so a need to work with Barlows). Having the telescope out anyway, I made some deep-sky images too the last two nights, of some bright summer sky icons. Again, I kept it simple. As I work from a town center, and a location where I cannot see the Pole star due to obstruction by a building (which hampers telescope alignment), I kept exposure times short, to 10-15 seconds. Then I stacked large numbers of images. The above image of M27, the Dumbbell nebula, a planetary nebula in Vulpecula, is my favourite. It is a stack of 57 images of 15 seconds exposure each at 2000 ISO. The faintest stars on this image are near mag. +16.8, which is not bad with short exposures from a town center. 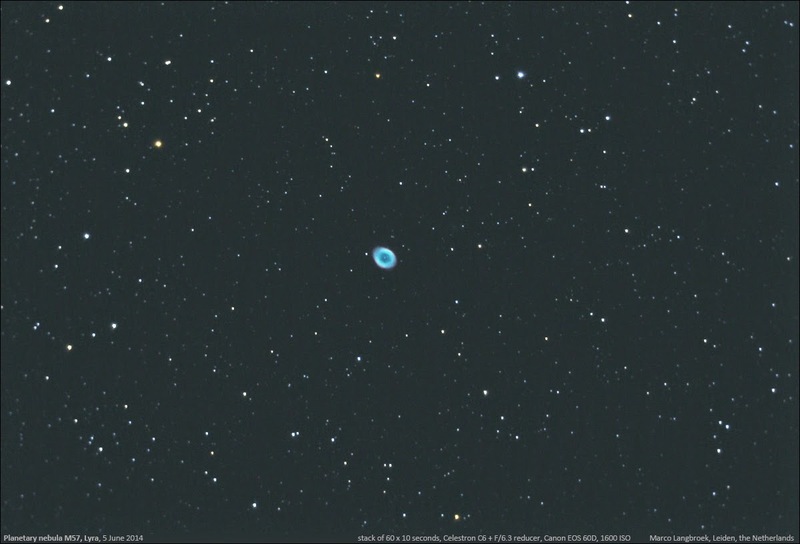 Another iconic planetary nebula in the summer sky is M57, the Ring nebula in Lyra. 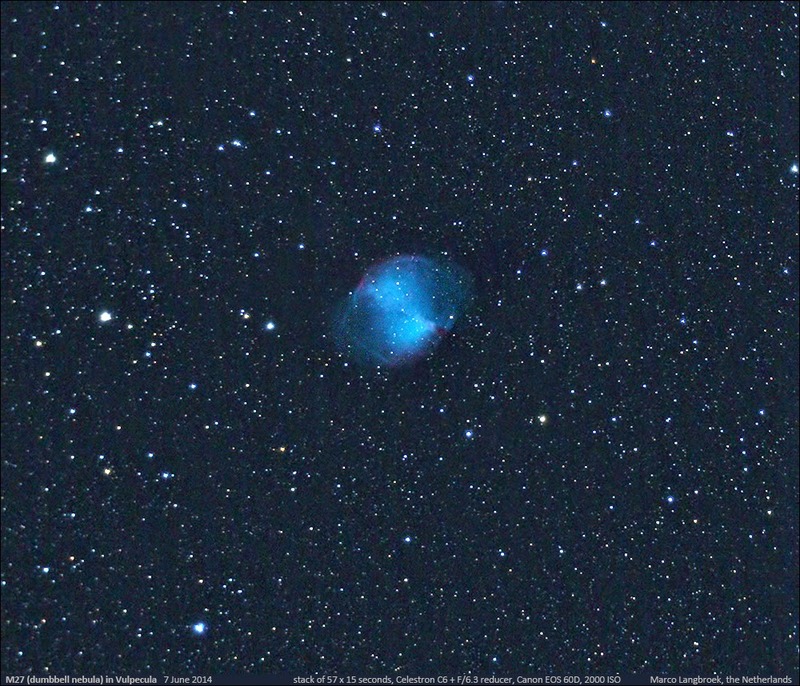 The image is on the same scale as that of M27 above. This image is the result of stacking 60 images of 10 seconds exposure (the scope didn't track that well that night) at 1600 ISO. 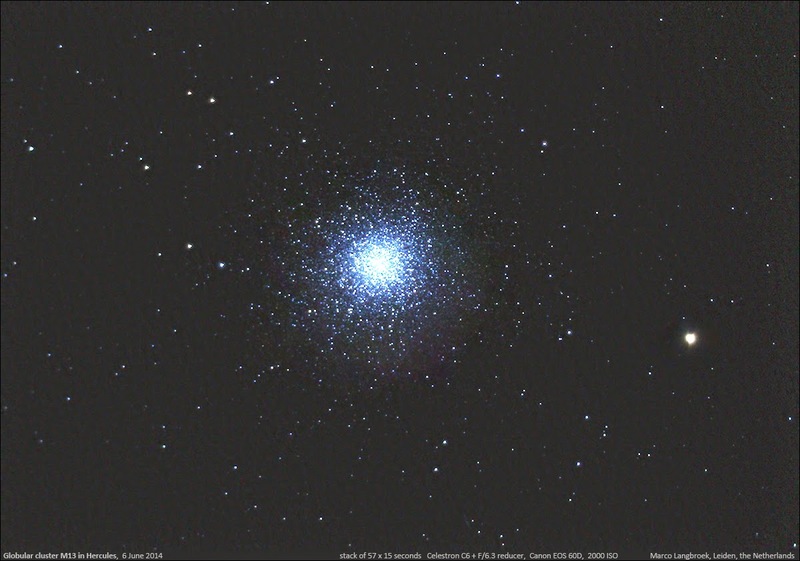 The final image shows globular cluster M13 in Hercules. It is a stack of 57 images of 15 seconds exposure, taken at 2000 ISO. Okay, so yesterday considerable confusion arose about the current orbit of USA 161 (see previous post). This was due to the (luckily shortlived) confusion between two objects: the real USA 161, and a Japanese spysat that was briefly mistaken by me for USA 161. 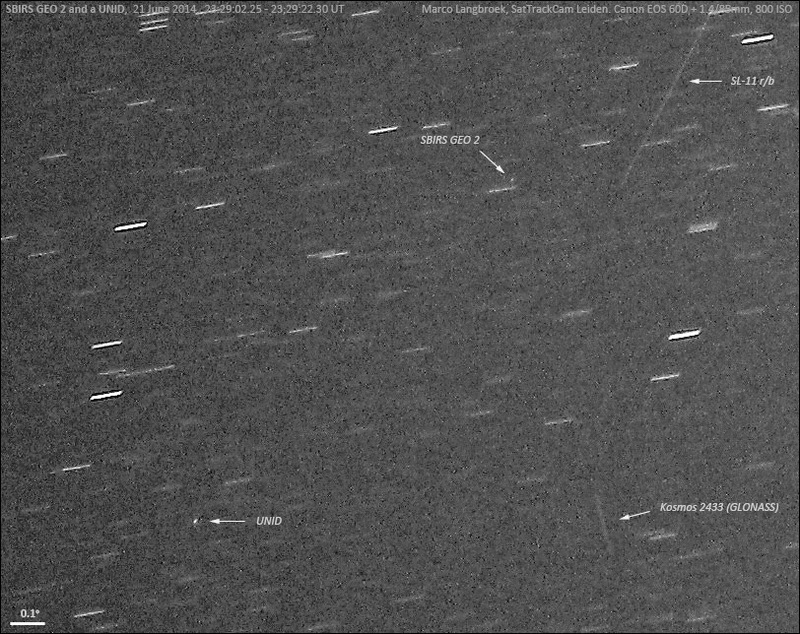 The object which I photographed during the night of May 30-31 and which Björn Gimmle photographed from Sweden on April 22, turned out to be not USA 161 but, as Cees Bassa pointed out, another classified object we had "lost" in the winter blackout: IGS 8R (2013-002C), a Japanese radar imaging satellite launched early 2013. This is the kind of confusion that can arise when multiple objects who's orbit have not been recently updated, move in a similar orbital plane. It does not only happen to us amateur trackers: even the professionals at JSpOC sometimes confuse objects. Actually, this situation ended positive with a double recovery: that of USA 161, and that of IGS 8R.